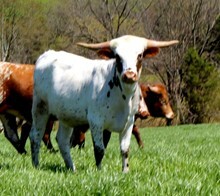 Charming Pearls may just be the perfect Longhorn heifer. We are so happy to have acquired her from Todd McKnight and we are proud to own her in a partnership with Jimmy Jones. She is out of Cowboy Tuff Chex and Field of Pearls. Her conformation is completely what we are looking for and her pedigree is the best of the best, along with a tremendous horn set measuring over 71" ttt. She gave us a 2016 heifer sired by 50/50 that might be the best heifer we have ever raised, and in 2017 she gave us another heifer out of WS Vindicator.